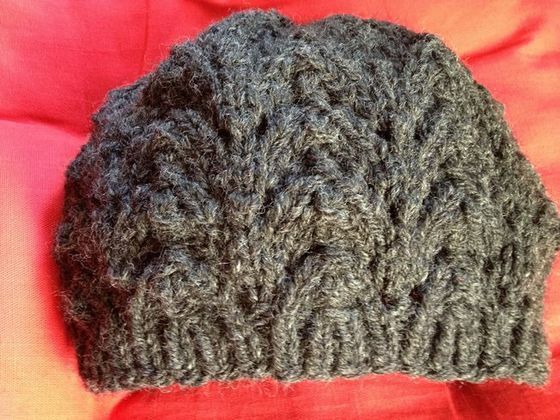 Fishtail Hat - A Chunky and beautiful hat to warm you up. A story behind the fishtail Lace hat. There is always a story behind everything including this Fishtail hat. It began with one cold and windy morning in January at our school bus stop. Many school kids were out playing while waiting for the morning school bus to pick them up. We just have a new first grade student who happened to be in the same class as one of my twin daughters. His nanny was often there with him and she always complains of the cold weather. I never saw her wore a hat or a coat. She always admired the hats my kids wore and asked where I got them. She couldn't really speaks much English, so we just did't carry on conversation except smiling at each other. When she saw me wore one of the hats I knitted, she asked how much it costs. I didn't know what to tell her because I'd never knit a hat for sale before. 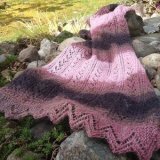 For me, it is priceless to knit something for someone. I told her it can be $5 or maybe $10 depending on the wool. She told me she would like a black hat with big wool. Well, to make a long story short. I took a break from knitting my friend's sock and went shopping for some yarn. And here it is today I got to share it with you, a charcoal fishtail hat for the Spanish nanny. I will bring it to her at the bus stop on Friday. It will be a little gift from me to keep her head a little warmer. I hope she doesn't mind the charcoal instead of black. ** Update, the nanny likes the hat a lot. She moved away shortly after that and we also moved from Maryland to Washington State. That's the end of my Fishtail Hat story! Description: A simple, fishtail lace hat for women or perhaps some men might like it too. 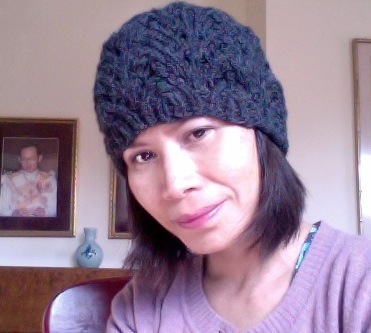 The hat is knitted in round with bulky yarn and size US # 10.5 (6.5mm). The 1 x 1 ribbing part is knitted with US # 9 needle. The fishtail pattern stops at the beginning of the crown part (where the decreasing begins). Finished sized: Head circumference measured 20 inches at rest and it can stretch up to 23 inches. It is about 8.5 inches in height. 3. One set of US # 10.5 (6.5mm) double pointed needles (dpn) Experienced knitter may use a very long circular needle using magic loop technique. Begin CO 72 sts using smaller circular needle. Join them in round. Rnd 1: *yf (bring yarn in front of work), k 2, sl 1, k2tog, psso, k 2, yf, k1; rep from * to end of round. Place marker at the beginning of round. Rnd 3: K1, *yf, k1, sl 1, k2tog, psso, k1, yf, k3; rep from * to last 7 sts, yf, k1, sl1, k2tog, psso, k1, yf, k2. Slip marker each time you have completed each round. Rnd 5: K 2, *yf, sl 1, k2tog, psso, yf, k 5; rep from * to last 6 sts, yf, sl 1, k2tog, psso, yf, k3. 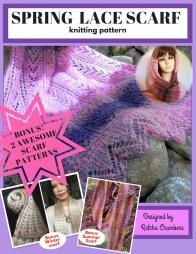 Repeat rnd 1 to 6 three more times until you have four sets of fishtail pattern. At this point the hat should measured roughly around 5.5 inches. Rnd 1: *K 6, k2tog; rep from * to end of rnd. Rnd 4: *K 5, k2tog; rep from * to end of rnd. Rnd 7: *K 4, k2tog; rep from * to end of rnd. Rnd 9: *K 3, k2tog; rep from * to end of rnd. Rnd 11: *K2, k2tog; rep from * to end of rnd. Rnd 13: *K1, k2tog; rep from * to end of rnd. Rnd 14-15: *K2tog; rep from * to end of rnd. Rnd 16: *K2tog; rep from * to the last st, k1. Cut Yarn leaving 10 inches tail. Thread the tail through the last 5 sts left on the knitting needles using tapestry needle. Repeat the process once more time to secure the sts. Weave the end to secure on the wrong side of the hat. Weave all loose end and trim off excess. When You done with the fishtail hat, send me a picture and I will post it on the web as an example.